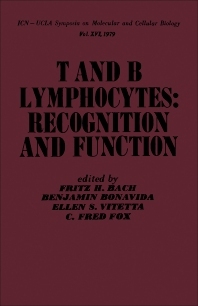 T and B Lymphocytes: Recognition and Function is the 16th volume of the 1979 ICN-UCLA Symposia on Molecular and Cellular Biology. This book is organized into seven sections, encompassing 74 chapters that summarize molecular level progress in the field of immunobiology. It emphasizes cell membrane, techniques developed for its analysis, and varied products of the major histocompatibility complex, as well as other receptors on cells of the immune system. The book starts by describing two approaches for molecular association evaluation. First is the use of artificial membranes or lipid vesicles for the incorporation of antigens for recognition by T-lymphocytes both at the afferent and efferent levels. Second is the chemical crosslinking of cell surface components with a variety of different crosslinking reagents. This is followed by a discussion on the molecular nature of a T-cell receptor that provides insights of the target(s) recognized by T-lymphocytes. Several chapters discuss data dealing with the issue of the apparent differential recognition by T- and B-cells while both use the same VH genes. Antiidiotypic sera, together with the activity of ""regulator"" T-cells, are also discussed, with regard to their role in networks of regulation of the immune response. This book presents works demonstrating that human T-lymphocytes can also be cloned and both noncytotoxic proliferating T-lymphocytes and Tc can be so obtained. This is along with the continuing studies regarding heterogenity of B-lymphocytes as well as macrophages. Part V focuses on the interaction between lymphocyte and virus and molecular modifications of viral-infected cells. The subsequent section deals with recognition, reactivities, and function of T- and B-lymphocytes. Considerable chapters in this section discuss T-cell cytotoxicity, dichotomy of MHC control over anti H-Y cytotoxic T-cell responses, mouse alloantibodies, and mixed lymphocyte reactions. The concluding part describes immunological tools, such as synthetic membranes and cloned T-cells with biological function. 43. What Is the Nature of the Antigenic Complex Recognized by T-Lymphocytes?